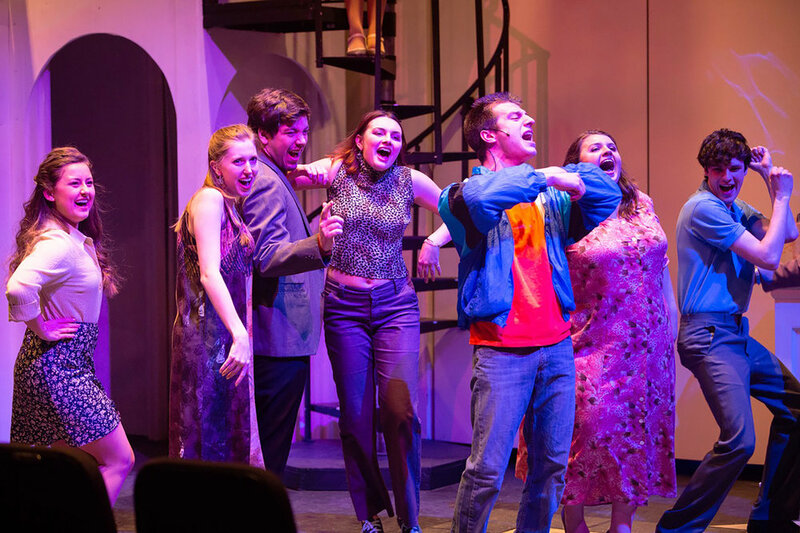 The Geneseo Musical Theatre Program put on “Women on the Verge of a Mental Breakdown” from Wednesday Jan. 30 to Saturday Feb. 2. The musical dealt with women in absurd and hilarious scenarios involving relationship problems (Courtesy of Ben Gajewski ‘07). Under the dimmed lights of Wadsworth Auditorium, Geneseo’s Musical Theatre Program presented “Women on the Verge of a Nervous Breakdown,” by David Yazbek and Jeffrey Lane, from Wednesday Jan. 30 to Saturday Feb. 2. The musical is based on the 1988 film by Pedro Almodovar. It is portrayed as a farce set in Madrid, focusing on various women. Pepa—played by communication major sophomore Kelsey Roberts—is in the center of the drama because her relationship with her boyfriend is suddenly ending. All the female characters have similar issues with the men in their lives, creating amusing, relatable situations throughout the show that everyone can appreciate. Art history major senior Abbey Anderson found the performance to be relatable to every woman. “I think this production is interesting because a lot of young girls put everything they have into guys and focus on that rather than focusing on themselves,” Anderson said. Three of the main female characters are involved with the same man, Iván—played by mathematics major sophomore Rocky Nardone—who claims love is eternal. Ivàn first abandons his wife and son for Pepa. Later, he sends Pepa a voicemail on her phone informing her he wants to break up so that he can run away with the female lawyer who is suing him. “It definitely is relatable for any young girl going through a breakup or anything dealing with guys in certain situations,” Anderson said. The audience sat onstage for a more intimate performance that involved direct interaction with the actors. The performers danced around the audience and even sang directly to certain audience members. The lighting and set created a visually interesting experience, fabricating the effects of various locations and environments. A projector displaying different images and videos created unique and humorous visuals for the audience, which gave the effect of a television in a home or the streets of Madrid during taxi scenes. The musical had a plethora of female characters that portrayed different types of women and the various strategies they use to deal with relationships. The show addresses infidelity, prudishness, abandonment and how women can question love and relationships. Director and choreographer Melanie Blood appreciated the cast of characters in the production. The comedic breaks and ironic timing allowed the audience to step away from the more serious topics in the musical like suicide, delusion, desperation for relationships and self-medication. The crowd was able to laugh at the vulgar language and ridiculous situations. The show emphasized the women’s passions that drive their actions in life and relationships. Blood posited that following one’s inspiration and goals should be one of the main takeaways of the show. The mix of heartfelt Spanish-inflected music, farcical but relatable situations and impassioned acting gave the audience a chance to reflect on the idea of relationships between men and women.